STUDENTS at Cherrybrook Technology High School have been singing and dancing their way back to the ‘80s in preparation for their next musical. 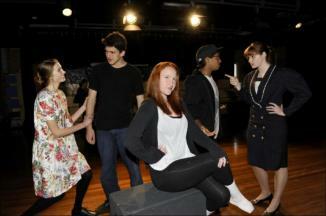 A cast of more than 40 students will star in the school’s production of the classic musical Fame. ``Auditions started at the end of last year and they have been rehearsing ever since then,’’ deputy principal Jenny Weal said. Fame follows the story of a group of aspiring performers who are all looking for fame and celebrity in the early ‘80s. Mrs Weal said the school was looking to take a different direction to their last production of HMS Pinafore. The cast of singers, dancers and actors will be supported by a rock band made up entirely of students. The ‘80s feel will be captured through the dress and style of the cast, as well as the classic songs including Bring On Tomorrow and Fame. ``We’ve got 25 teachers involved from all across the school this year, doing everything from ticket sales to seating,’’ Mrs Weal said. Fame will show at the school’s multi-purpose centre from 7pm on June 7 to June 9. There will also be matinee performance at 11am on June 7 and 9.